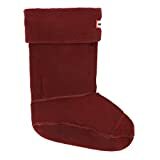 These dulse boot socks are designed to complement your short Hunter wellington boots and are a great way to personalise their favourite boots. Crafted from a micro fleece, the cuff can be folded over the wellies to display the iconic Hunter logo. They will keep your feet warm and give your wellies that personal touch. Size: [Medium: UK 3-5], [Large: UK 6-8], [XL: UK 9-11].